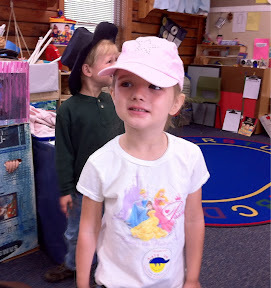 Today at Alyce's school was hat day. It was combination / information day about kids and cancer. If a kid brought in $.50 they got a sticker and could wear a hat. I don't know how much they talked to preschoolers about cancer but I'm sure the kids liked the change of pace. Something interesting happened on the way to school. To get to Alyce's school we have to drive past a high school. This high school is currently undergoing some upgrades including adding some buildings. To facilitate the earth moving there were two excavators on site. As we drove past Alyce said "I see two diggers". I told her that I didn't see them. She said that "I'll see them next time". I asked her what those diggers were for? Her response was "to dig foundations". Alyce has been learning about construction at school and she's been into Bob the Builder but I didn't expect her to know what a foundation was let alone that you use an excavator to dig one. 0 comments on "Hat Day"